This project was created on 08/08/2015 and last updated a year ago. TL;DR: I want to build a cheap and small hardware device that is a powerful CAN bus reverse engineering tool, but can also become a versatile ECU; I want to build a community around automotive reverse engineering; I want to make instructional videos on the topic. Cars are transforming from nearly 100% mechanical devices to nearly 100% electronic devices; this brings a whole new set of interesting features, but it also uncover a huge set of issues ranging from security to safety to privacy concerns. While you once could completely disassemble your car engine to know how it works and modify it, now you need different tools to "disassemble" the car system. With the Crunchtrack you can now reverse engineer what&apos;s happpening on the CAN bus and then reuse the same hardware to write your own firmware to improve and modify your vehicle. While I developed the Crunchtrack with the automotive field in mind, it became clear pretty soon that the board had a lot of potential in a lot of other applications. 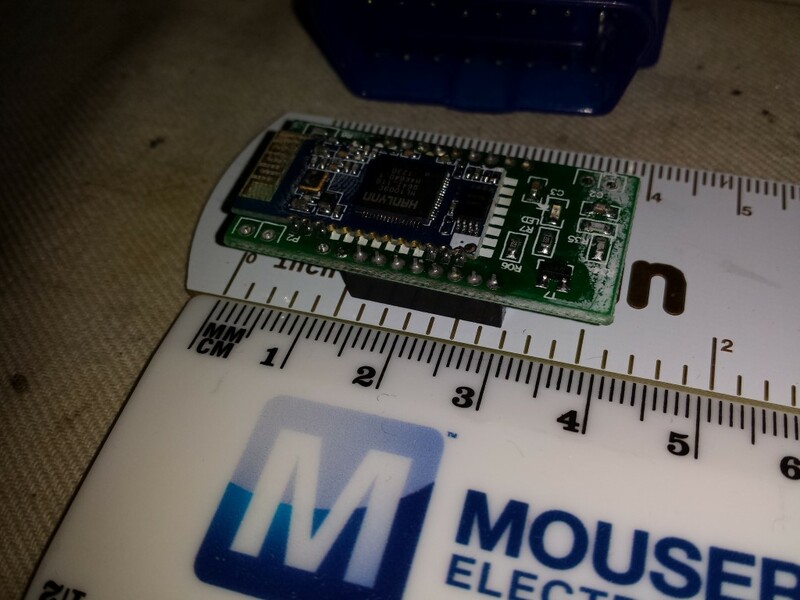 The very small board with a powerful MCU, a wide supply range, GSM, GPS and SD card is very flexible, so I bought it to the BattleHack Hackathon to see how far it could go. I pretty soon found three other members to form a team and we started working on an idea I had for a while: an anti-theft device for your notebook that could locate it anywhere and disable it. Almost every modern (cheap) notebook has some spare space to install the Crunchtrack; even if you have the latest ultracompact, as long as there’s an optical unit you can swap it for a caddy with a second hard drive, freeing up some precious space. The Crunchtrack can then be connected straight to the battery connector on the mainboard, to ensure that it will be always online, independently from the OS or any other variable. Now you can find your PC anywhere in the world, and issue commands remotely. …but that’s messy. A better way would be to have the [always encrypted!] data on an SSD drive and short the notebook battery to the flash chips in a way that would destroy them beyond recovery. That’s a very nice way to wipe data, as it only requires a mosfet and can be used to burn the motherboard too, flipping the finger to the thief that will not be able to resell your notebook anymore. For our presentation, we went for a good show for our audience, and decided to use explosives. Everyone who played with model rocketry will know this basic detonator design: we basically heat up a diode enough to light up a match taped to it, which in turn ignites something else (in our case a strip of firecrackers). I had to put a resistor in series to slow down the diode burning rate, as the LiPo battery I used in the demo was providing too much current and destroyed the diode immediately. So how do you debug/develop for the Crunchtrack? Hardware-wise, the setup is very simple: I designed 2 boards, one is a breadboard adapter that breaks out all the pins from the expansion connector, and the other is the debug adapter that connects the debug connector to ST’s STlink debugger, sawed off from a Nucleo board. What bugs me, is that I can design a complex board like Crunchtrack’s without a single error, and then make stupid mistakes on an extremely dumb board like that adapter. In this case, I made the most classic of mistakes: I swapped TX and RX. As an afterthought, I also added a Reset button. Boards are available in the GIT! With this code it’s easy to test the GPS and the GSM functionality of the board, as it just forwards the serial port of either the GPS or the GSM to the PC’s serial port. There’s also a basic implementation of the GPS parser library that handles the raw GPS data and prints out coordinates and other data. I tried hard to get the GNU toolchain working, but had no success yet. As a backup plan, I’m now working with IAR EWARM tool suite that “just works” and allows me to debug code with no extra configuration at all; I just have to press “run”. Moving back to the GNU toolchain is going to take no effort, as the code is the same. it takes just too much effort to set it up and right now I want to focus just on coding. The IAR suite is also available in two free versions, a code size limited one and a time limited one, so it should be good to get started. From the start, I wanted the Crunchtrack to be a very wide project where my own hardware plays only a relatively small part. True to my intentions, I finally put the first prototype of the wiki online! It&apos;s a basic Mediawiki installation, there&apos;s not much yet; I decided to inaugurate it with the first page about the first tutorial on how to get basic informations about cars. The first prototype of this board was a disaster. I whipped it up in a rush just to fill some spare space before sending the main board to print, and while the Crunchtrack prototype came out nearly perfect, I messed up almost everything in this very simple board. The goal of this board was to provide some supply filter and the CAN transceiver; I also included 6 jumpers to allow the user to choose one of the three standard CAN pin sets. Well, I got them all wrong. I even swapped CAN H and CAN L in two places! So that&apos;s the two red bodge wires. The other ugly thing is the TO92 78L05 soldered on a SOT23 space: I designed the board to accommodate a smaller regulator, but when I assembled it it blew up when I applied the 12V power. Turns out that you can&apos;t find wide input linear regulators in that size, and the one I was using had a max input of 6V. Last mistake is the big electrolytic cap on the upper left; of course metal can electrolytics are too tall to be squeezed between the two boards and I&apos;ve replaced it with a tantalum one. So I just redesigned the board, available in the Git, but beware: it&apos;s not tested yet! Schematics are online! As a bonus, I designed 2 verisons of the packages for the SIM800 modules, one with all the pins and one with only the mandatory pins to get the module up and running. I had to resort to this trick to save space for the tightly packed tracks, that on the PCB are spaced at 6/6 mil. A better board manufacturer would allow me to decrease the size of the tracks, but that&apos;s for a future prototype. I don&apos;t like having the modules "flapping around" in the breeze with most of their pins unsoldered, especially in the mechanical stressful environment that is a vehicle. An important goal that I set for this project is that it must be easily replicated and modified by everyone; that&apos;s why I went for a 2 layer board and and a microcontroller in a LQFP package. 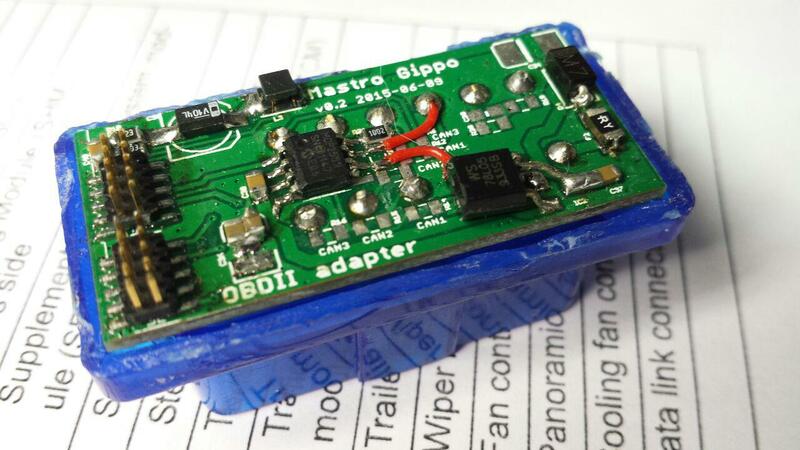 To meet regulations I will probably have to switch to a 4 layer board in the production version. For the first prototype I went for a SIM800L as the GSM module. This incredibly small module provides a basic GPRS connection; while the 2G network is getting discontinued in the AT&T nefwork in 2017, there are plenty of other countries where the device will still keep working and hopefully I&apos;ll be able to find 3G/4G devices of a similar size on the market. 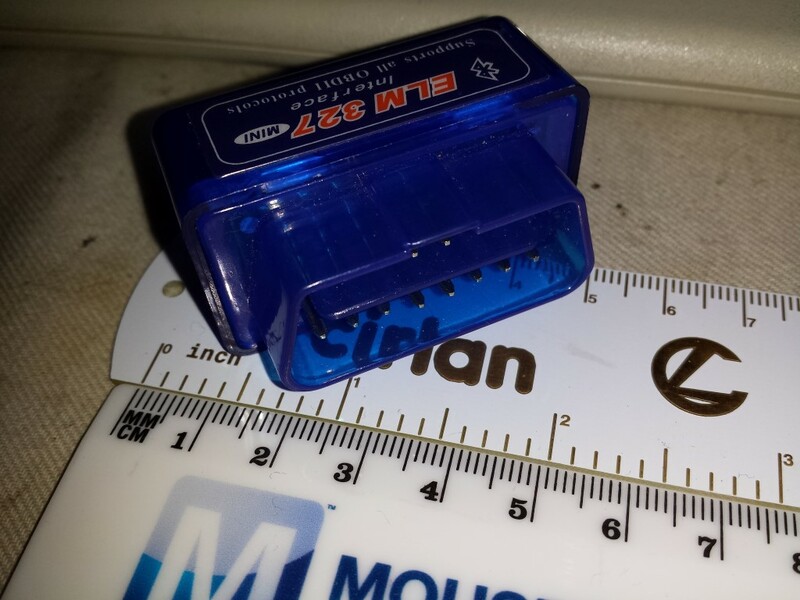 Another problem of this modem is that it has pins on the bottom like a BGA, and soldering will be harder than a normal BGA chip because there are actually components inside that module that may move around during soldering. Because of that, an important restriction is that this module can&apos;t be oven reflowed while being mounted on the bottom side of the PCB as the components inside may just fall off. And since I&apos;m using two modules here, I need to place them on the same side of the PCB. While I was aware of that problem, I decided not to care as I was going to manually solder them and I knew I was going to redesign the PCB sooner or later anyway. That didn&apos;t work of course, and I messed it up beyond repair, a very nice excuse to start working on the second prototype. While working with electric cars, I stumbled upon two very interesting open source projects:the Open Vehicle Monitoring System, an IoT device to control every aspect of your car from a smartphone app, and the GEVCU, an universal ECU especially designed to handle the common problems faced when converting an ICE car to electric. Inspired by these two devices, I want to build something that could take the best of the two approaches to very similar problems. I have a few goals in mind. – It will have an USB connector, so the user will be able to easily update firmware and, most important, load a custom firmware to temporary use it as a Reverse Engineering tool. This way, the user will not need to buy other tools and will be encouraged to develop new functionality. – It will be cheap. I’m aiming at a price a bit higher than the OVMS. I just described the hardware, but my vision is bigger than that. Right now, if someone wants to find infos on a car’s CAN bus, he/she has to sort through a lot of noise. A lot of reverse engineered messages can usually be found on the documentation of the various projects like the OVMS, but other times they’re buried under thousands of messages on forum threads – and you may find later that they’re wrong, as it was documented a few posts later, so you have to read the entire thread to get useful info. Been there, done that. More importantly, there’s no standard way to present this kind of information. I think that we need to create a common repository/wiki database where we can share this kind of information with a common standard, aiming at being able to automatically download a “descriptor” file that can run on an universal software. More on that later. I want to make instructional videos on the lines of the EEVblog. I’m a very practical person, and I learn stuff only by doing it; my videos will be targeted to people like me, focusing on a defined task and explaining every step taken to get there. And that’s about it for the general idea. Stay tuned for more info! "I’m aiming at a price a bit higher than the OVMS." and how much is the OVMS? seriously, can&apos;t find it listed anywhere. The website idea sounds fantastic, and the hardware looks very interesting as well. One question: When you say, "download a “descriptor” file that can run on an universal software" I think you are mostly describing a CAN database (aka a .dbc file). Since most current CAN development software can accept dbc files, why not stick with them to better achieve some kind of universality? You are about to report the project "Crunchtrack", please tell us the reason.